Crafters typically use beads to make jewelry or to add decorative elements to bridal gowns, pillows and textile art. But with a little heat, you can melt beads and made them even more versatile. 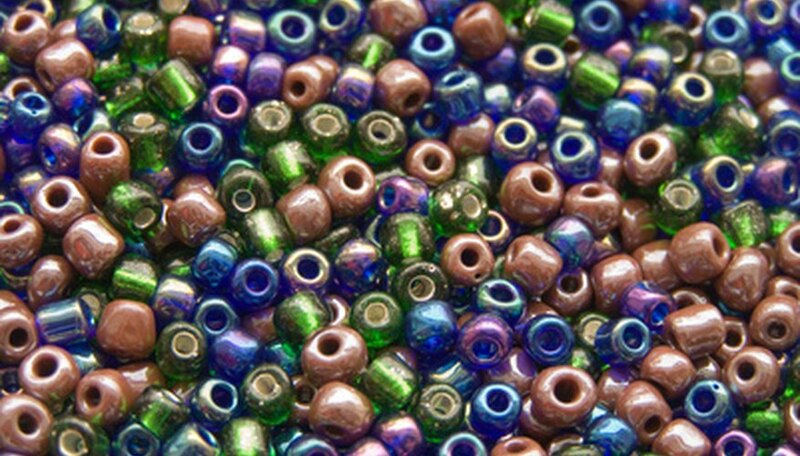 Explore this off-label use for beads by trying out a new project. You can make a melted bead bowl by baking beads arranged in a circular glass or metal pie pan covered with tin foil. Use one color to make a solid-colored bowl or multicolored beads to create colorful shapes and patterns. You could even spell out your name. Bake the bowl to melt the beads and fuse them into a solid disc. Once the disc cools, balance it on top of an upside-down ceramic bowl covered in tin foil and bake again. The heat of the oven will melt the sides of the bead disc, causing them to fall and completely cover the ceramic bowl. Once you have removed the beads from the oven and allowed them to cool and harden fully, you will have a new bowl made of entirely beads. Keep in mind that beads are not made of food-safe plastic. A twice-baked bead bowl makes a great centerpiece, but you should not use it to serve food. You can melt beads to create unusual night light covers. Arrange transparent and translucent beads in heat-resistant craft molds or specialized baking pans for Madeleine cookies or miniature bundt cakes. Bake the beads to melt them and create a decorative night light cover. Attach your melted bead creation to a prefabricated night light. Make a melted bead painting by arranging beads of different colors to completely fill a tin foil-covered baking sheet. Bake the beads in your oven to melt them together. When your bead painting cools, you will have a solid sheet of melted beads. Place the finished piece in an open-backed frame or prop it up on a bookshelf or mantle. You can make faux stained glass suitable for hanging in front of a window using a similar technique to the melted bead painting. Use only clear and translucent beads to create your painting, then hang the final piece in a place where it will catch the light, like in a sunny window or on a hinged glass door. Tim Hesse has been writing professionally since 2000. He has written and edited for a variety of print and online publications, including Salon.com Tech Tips, FOXSports and Automated Homefinder. Hesse enjoys covering music, film, the open-source movement, education and the arts. He studied cinema and television production at the University of Southern California.